Chop the chorizo into small chunks and add to the pan with the onion. Transfer the mixture to a large pan, add the stock, seasoning and bay leaves, and cook until the potatoes are soft. Meanwhile, very finely chop the cabbage (alternatively, buy a cabbage-shredding machine from the market as we did). When the potatoes are ready, mash them into the broth to make a thick base. Blanch the greens in boiling water for one minute to take off any bitterness, drain, then add to the simmering broth. 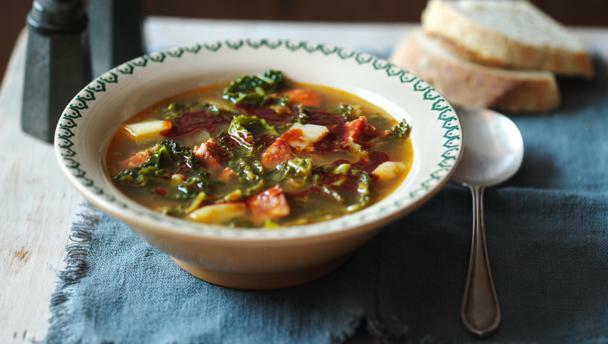 Mix the smoked paprika with some olive oil to make a dressing, and swirl this red magic into the vibrant green soup. Serve with some rustic country bread.